In 1994 the T/MC begin a survey to learn what organizations in Chicago offer forms of volunteer based tutoring/mentoring. From the responses to this survey the first conference was organized in May 1994 and the first Tutor/Mentor Directory was printed and distributed to about 300 programs, businesses, foundations, media and political leaders. 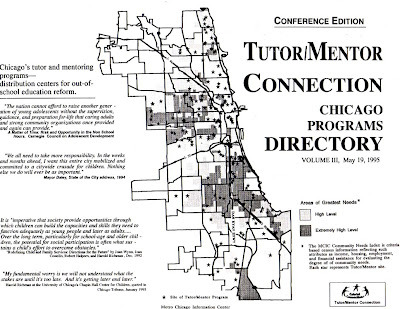 In spring 1995 the T/MC began to plan an August/September Chicagoland Tutor/Mentor Volunteer Recruitment Campaign, aided by Chicago Access TV who agreed to build a special tutor/mentor bulletin board on CANTV42 and by organizations who were meeting as part of an Intergenerational Network. This section of the Tutor/Mentor Institute Site has material to be used in the volunteer recruitment campaign. Initially the campaign was built around volunteer recruitment fairs held in different parts of the city and hosted by different tutor/mentor programs operating in those sections of the city . In 1998 a multi-year grant of $26,000 per year was received from the Children's Care Foundation and a part time organizer was hired to work on a year-round basis to build the campaign. As a result the campaign grew to include more than 150 organizations at more than 20 locations by 2002. Mrs. George Ryan was recruited to be honorary chairperson for the campaign and Chicago Public Schools CEO Paul Vallas gave his support by speaking at press conferences to kick of the recruitment fairs. Between 1998 and 2002 the Tutor/Mentor Connection began to put its Directory on line in a searchable program locator. Since then an interactive map version has been added. This growth of the Tutor/Mentor Connection between 1993 and 2000 was greatly enhanced by the pro-bono support of Public Communications, Inc. , a Chicago PR Firm. 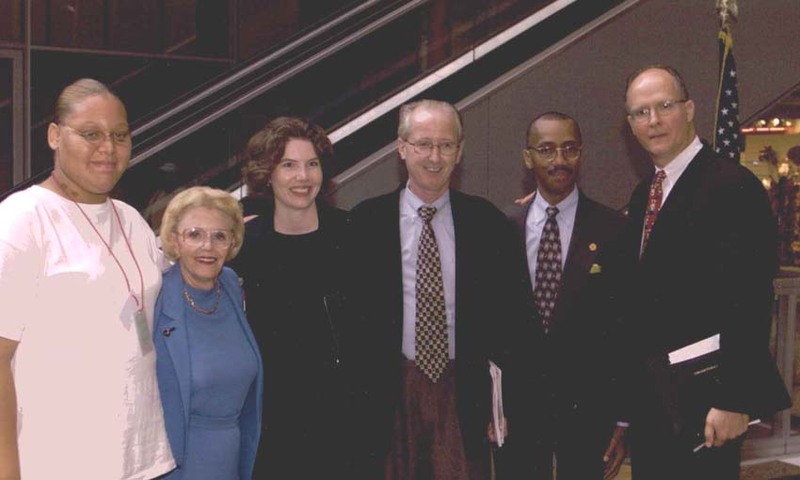 They helped generate media coverage and helped build the Tutor/Mentor Connection Case Statement and Strategy in 1993. This photo shows Mayor Daley at a May 1997 Tutor/Mentor Conference along with myself and Noel Himes of PCI staff. What has happened since 2002? The grant for the volunteer-recruitment organizer was not refunded after 2002 and no new donor stepped in to fund the role. The economic decline post 9/11 caused PCI to cease its support (especially since T/MC was never able to raise part of the funds needed to continue their partnership). The lack of funds caused the T/MC to reduce all efforts at print communications and reduce its support for the volunteer recruitment fairs. However, the partnership with Access TV continued and slide shows in August and November on Cable Channel 27 encourage volunteer involvement. In addition the on-line visibility for the Tutor/Mentor Connection continues to grow and now a search for "tutor mentor" on Google results in T/MC web sites on the first page. Thus, our efforts to educate leaders to use their own communications and web links to promote tutor/mentor can increase the number of people who use T/MC maps and the on-line directory to find places to volunteer, donate and get their kids enrolled. What has happened since 2011? Since creating the Tutor/Mentor Institute, LLC to support Tutor/Mentor Connection in Chicago, I've continued to use social media and my list of tutor/mentor programs, to try to help programs in Chicago attract volunteers and donors, and continue to model actions that I hope others will take. However, lack of organizational structure, lack of funds, and difficulty keeping technology updated and working, limits my impact. I still need to find money to invest in marketing, technology, and in events, awards and competitions that will dramatically increase the number of people who look for ways to be part of tutor/mentor programs in Chicago and every other big city.